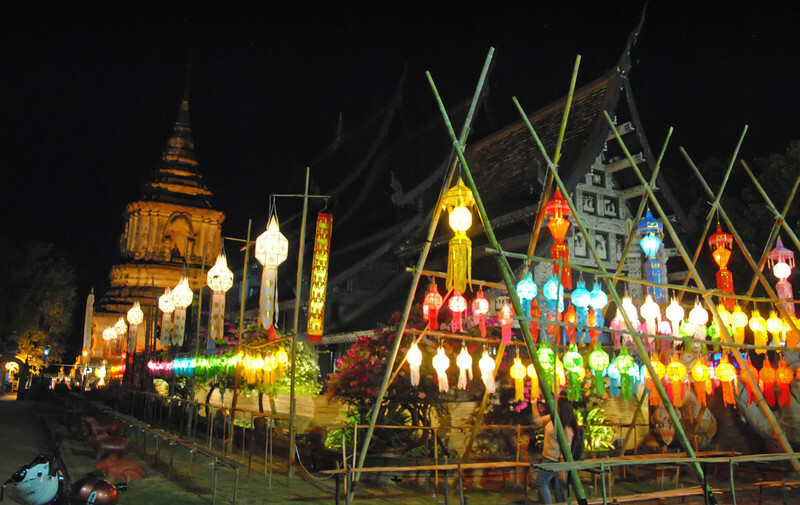 The full moon celebrations are still in full swing in Chiang Mai. 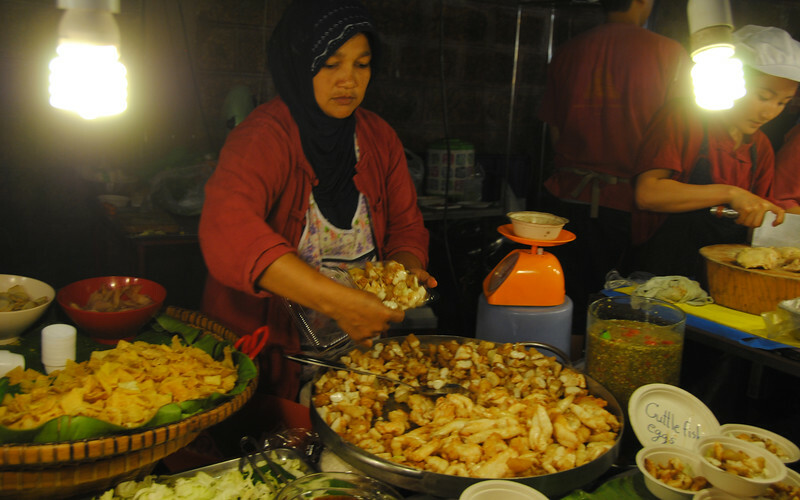 Typically throughout the rest of the year, the population here numbers around 400,000 people, but during Yi Peng, an additional 200,000 tourists flock to the city, exploring every nook and cranny during the week around the full moon. We arrived a few weeks before all the mayhem, but because we're travel fatigued, we didn't venture out too much. Now with Iva pulling us out into the city during the few short days that she's here, we're astounded at just how many people are here. 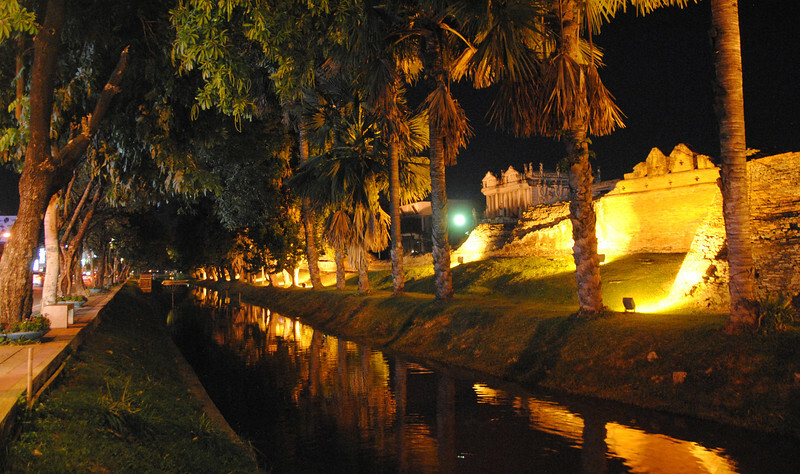 The old town of Chiang Mai used to be walled off in a square. 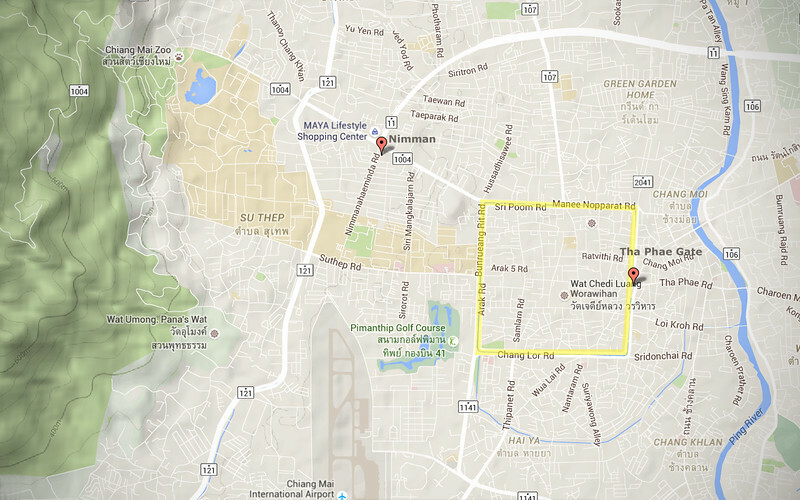 You can see the configuration in the map above. Today, most of the walls have crumbled away, only the four corners and a few bits exist along the moat that still surrounds the old city. We still don't know the city very well, but we use these corners and wall bits to orient ourselves when we're navigating through Chiang Mai. 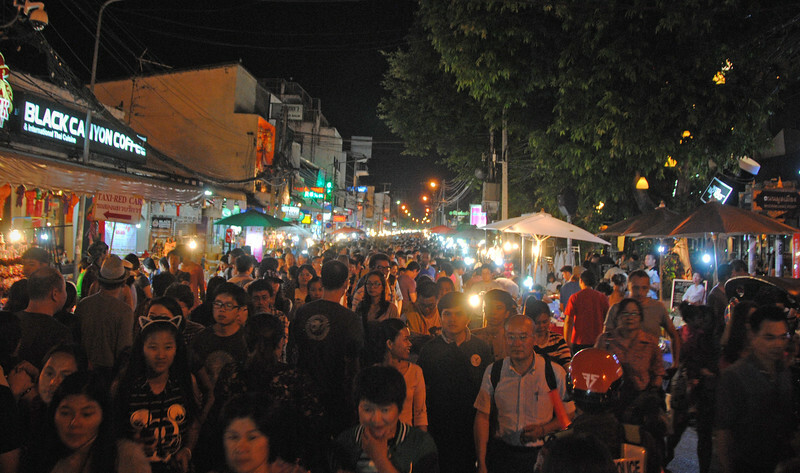 Tonight, we're walking to the Sunday Night Walking Street Market, which is held near the Tae Phae Gate, on the other side of the city. As we get closer to the old town the crowds become a lot thicker. 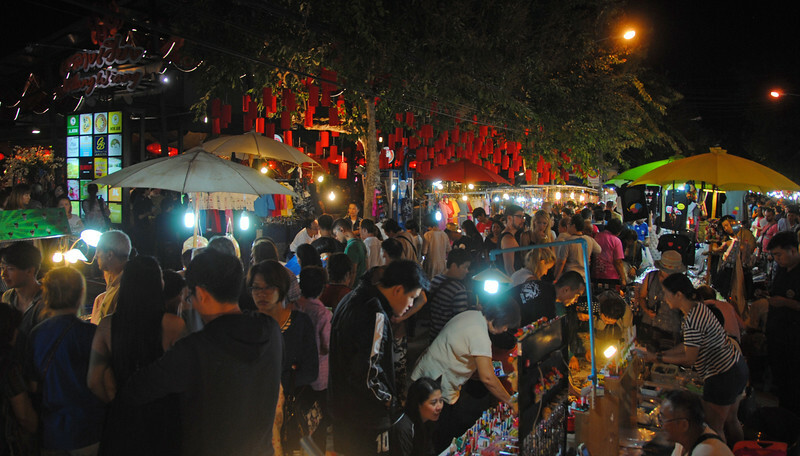 It just so happens that the bazaars during Yi Peng are absolutely packed. There is barely any room to move! A few times I lost Neda and Iva because while they perused the stands looking for bargains, my eye was glued to my camera. Need shoes? You've come to the right place! 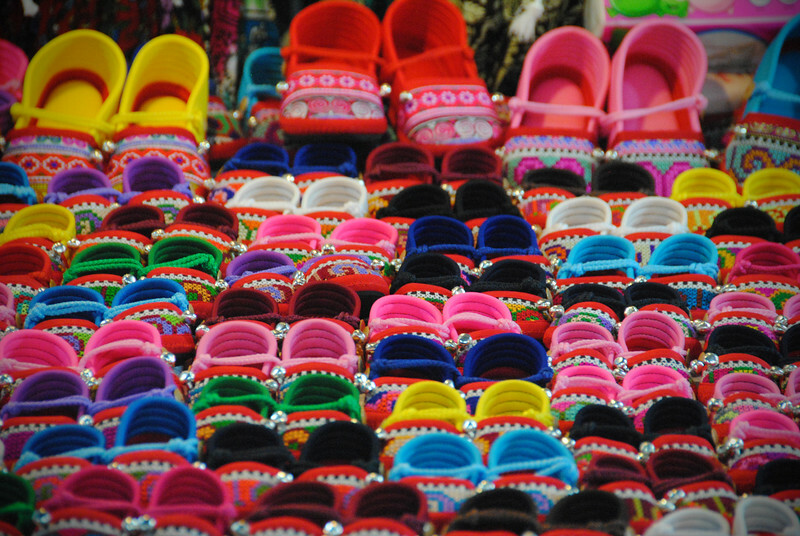 These are Hmong embroidered shoes, mostly for kids. 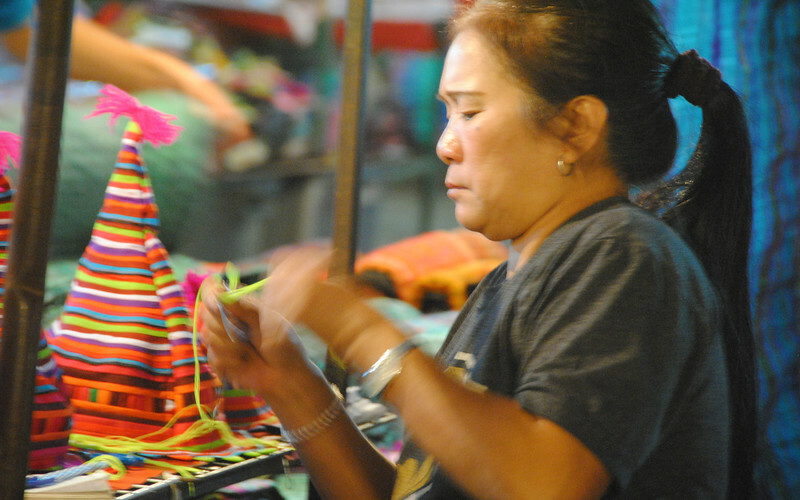 The Hmong are one of several ethnic hill tribes that live in Northern Thailand. Each of the hill tribes have their own dialects and style of dress. 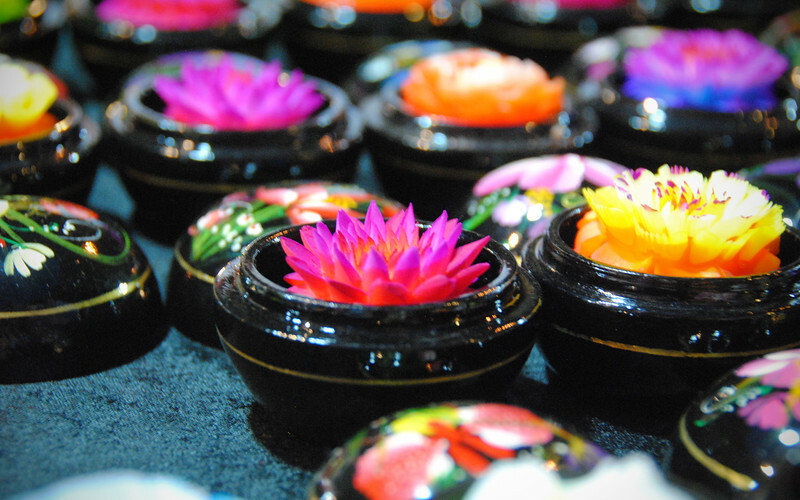 These are tiny dyed soaps sculptures carved into flowers! 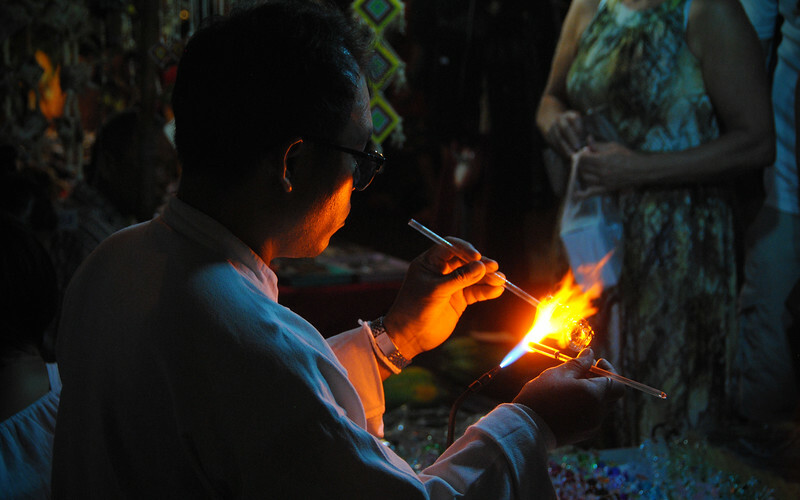 We saw a guy making them, it was quite intricate. So small it fits in the palm of your hand. These ladies are from the Karen hill tribe. They seem to wear less embroidered clothes than the Hmong. 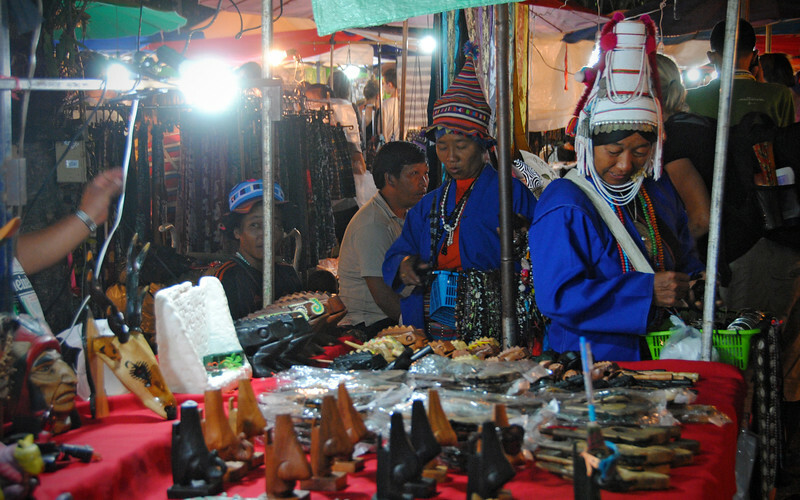 Some of the Karen hill tribe women wear gold rings around their necks to stretch and elongate them over time. I'd like to visit a Karen village and see this during our stay in Northern Thailand! See those red covered trucks? 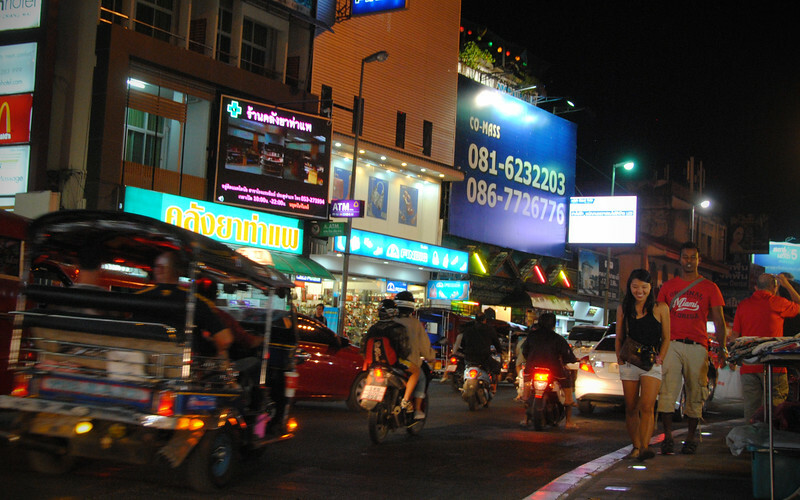 They're the most popular mode of public transport in Chiang Mai. They're called Song Thaews, but Iva called them Fire Trucks and the name stuck with us. Having been here for a while, we also found out these Fire Trucks are the cheapest method of getting around. 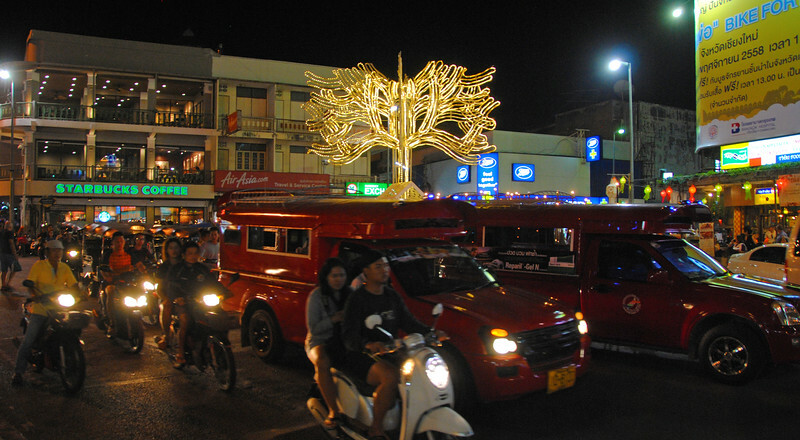 Only rich farang tourists take the tuk tuks, which will cost you about 50 baht ($2) to get you anywhere in the old city. By contrast, hail a Fire Truck heading in the direction you're going and it will only cost you $20 baht (less than $1). The only catch is that you share them with whoever else hails one along the way, and the Fire Truck driver will often take the least direct/most circuitous route to pick up as many passengers as possible. 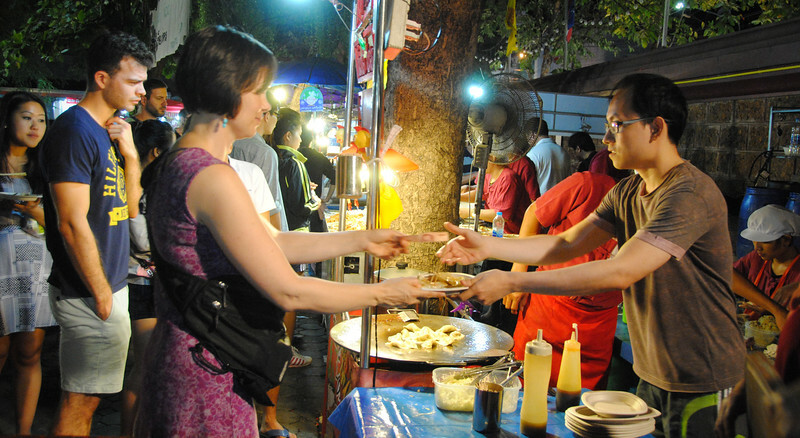 Still, it's a good deal and we feel like such locals willfully ignoring all the drivers who cluck at us as we walk by: "Tuk tuk? Tuk Tuk?" 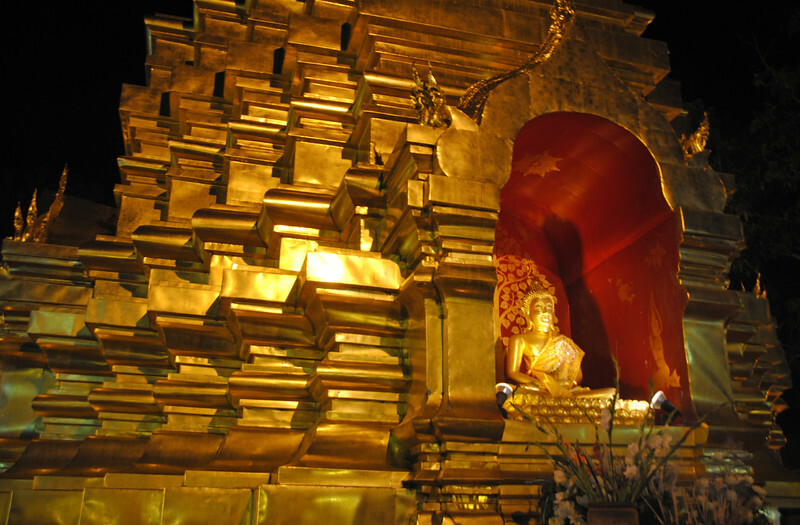 When we first arrived at Bangkok Airport, we saw lots of signs and posters informing us that it is disrespectful to use the imagery of Buddha, either as pictures or statues for decoration. 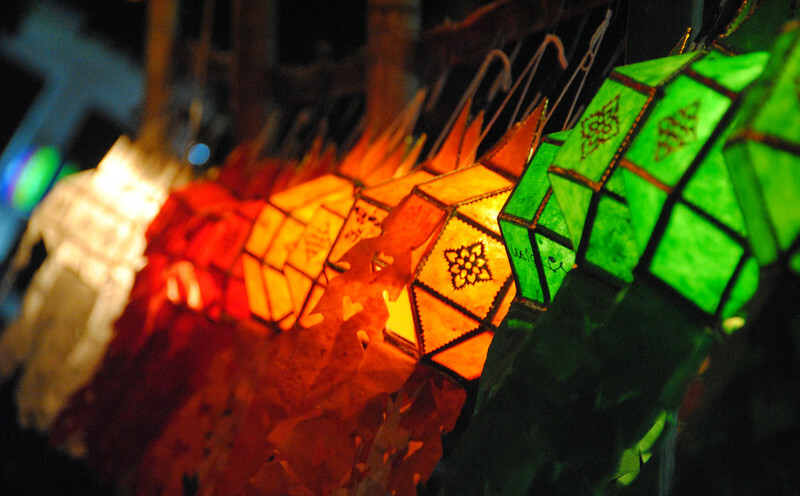 Since it's a very religious symbol, Buddhists only use it for worship. 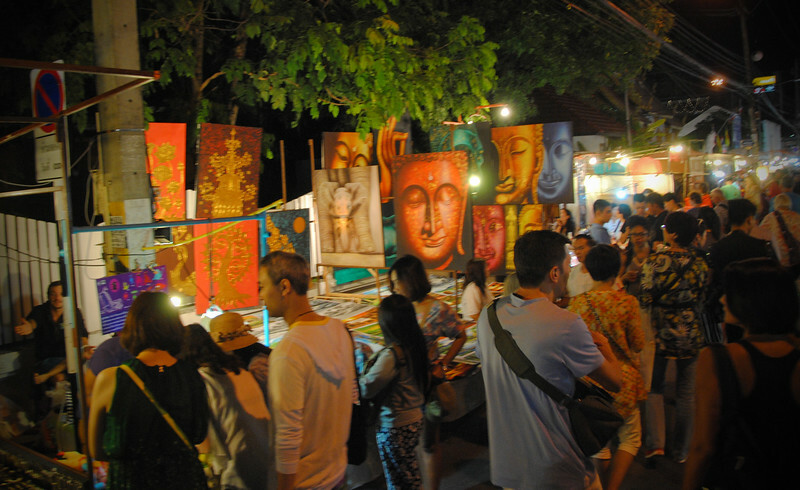 So all of these Buddha paintings and carvings that are sold to tourists to hang on bathroom walls and used as garden sculptures are very offensive. 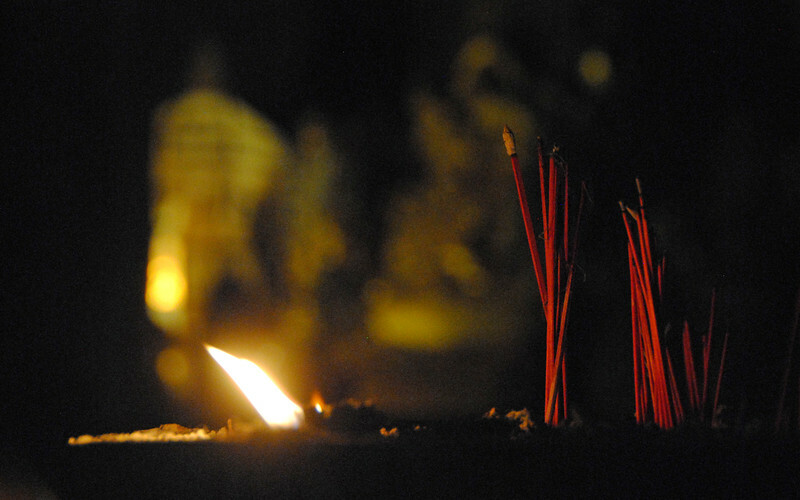 Incense and bells are two of the most important objects in Buddhism. 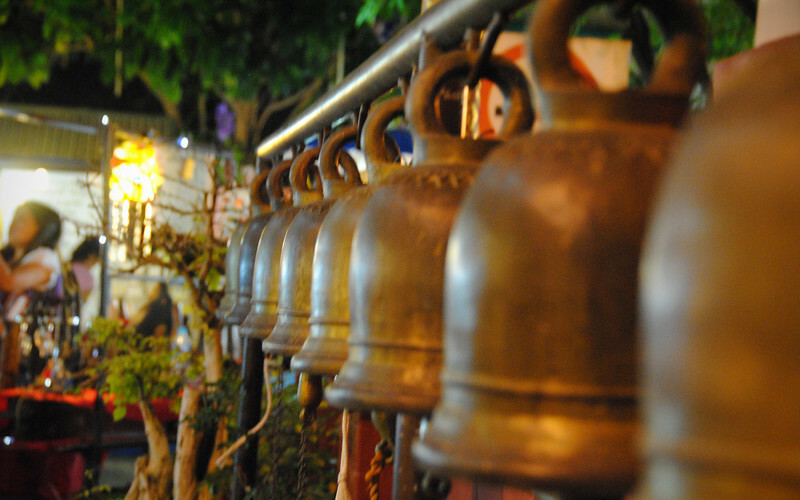 The bells signify the voice of Buddha are a call for protection by heavenly deities. 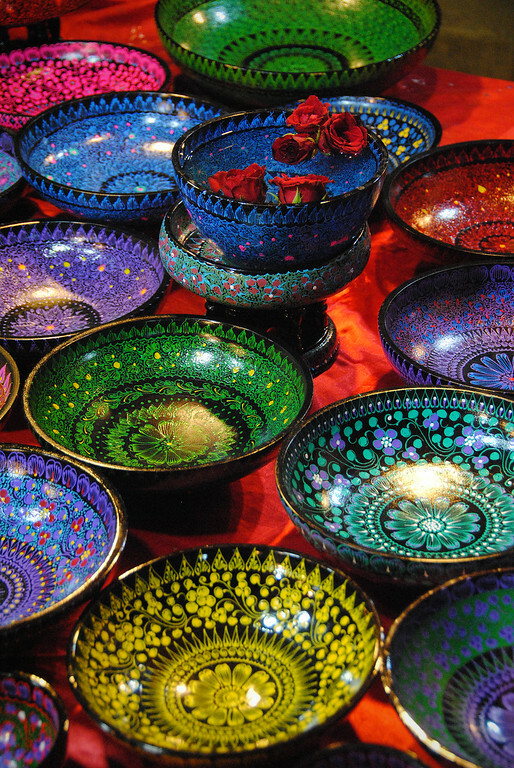 Colourful painted bowls. 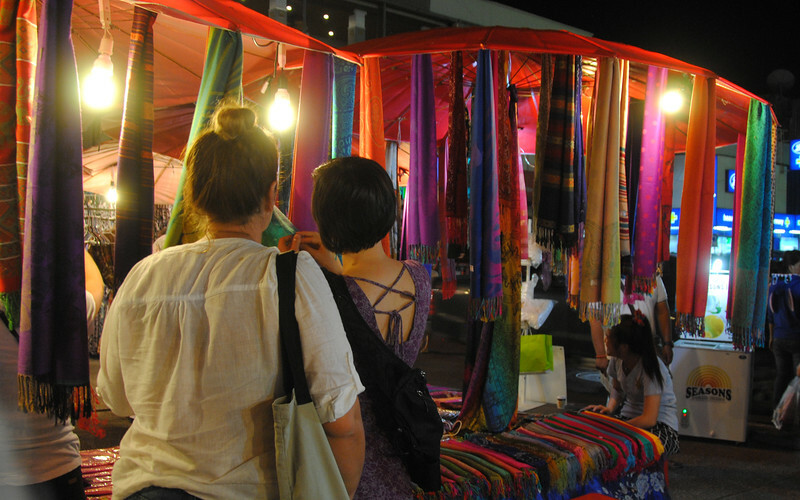 The Bazaar makes for some colourful night-time photography! 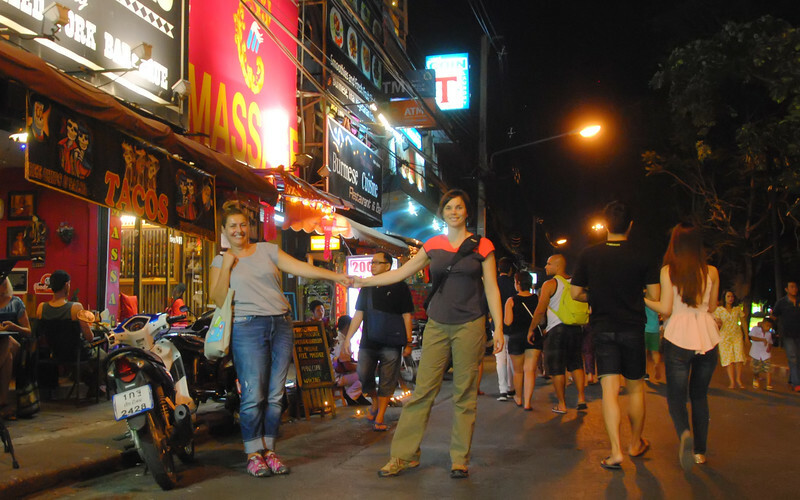 I'm glad that we took a week off before Iva came to visit us in Chiang Mai. We have quite a full itinerary while she's here... But if it wasn't for her, we wouldn't see any of it! Of course food plays an important part of any celebration! Gahhhh! So many people! Is it wrong to long for Yi Peng to be over and wish them all away from our city?